One of these days, your child is going to ask for his or her own smartphone. Since most of today’s parents didn’t grow up with cell phones, deciding when to say yes is not an easy question for many of us to answer. For all their convenience and even with parental safeguards, smartphones may be more responsibility than your child is ready for. Some of you read the headline to this post and immediately began shaking your head. You know already that your child isn’t ready for his or her own smartphone. It’s an easy decision for now. But what signs should you consider in the future? Perhaps your child’s afterschool schedule is getting more and more complicated, with play dates, music lessons, sporting events and practices, or club meetings requiring more nuanced plans for all the drop-offs and pickups. Consider whether your kid is up for the responsibility of carrying around an expensive piece of electronic equipment wherever he or she goes. Is your child good about following rules you’ve set in other areas, like television use, homework, and bedtimes? Is your child well organized or absent-minded? Are they careful enough with other electronic devices they have access to at home? It’s easy to spot the signs once you start looking. Should you find yourself game but cautious, a basic phone might be the way to go. While it serves its most important purpose (your kid can text or phone you in an emergency) and introduces the concept of owning personal electronics, it doesn’t place the whole worldwide web at your kid’s fingertips. Plus, if it gets lost, you’re only out the price of a basic phone. If you decide your child doesn’t need the training wheels of a basic phone, and you’re ready to dive right in with a smartphone, set some limits. Set a rule that the phone charges overnight in the kitchen or living room, eliminating the possibility of late-night texting or gaming. Talk to your child about all facets of responsible tech use, and set up a device contract to outline the responsibility your child is taking on. Don’t forget to include cyberbullying in your chats, both the dangers of being a victim and participating. Check out the information on stopbullying.gov to learn more. Many parents track their child’s phone usage, particularly for tweens and younger teens. 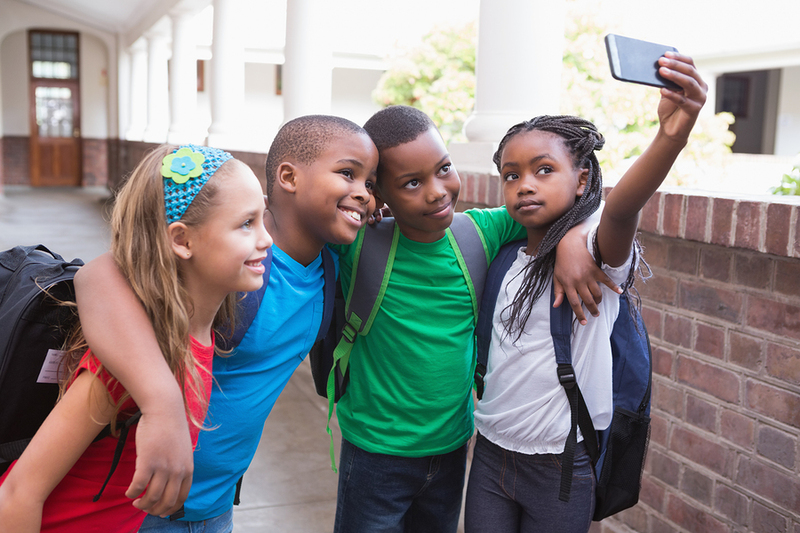 Tell your child up front if you’ll be doing that—for many kids, knowing that their phone is subject to inspection at any time can provide the excuse they need to stay out of trouble with the device. If you treat phone check-ins as a mutual opportunity to answer questions and share ideas about the best ways to use technology with your child, they don’t have to feel intrusive or like punishment. There are lots of apps and services to help parents keep tabs on their child’s iOS, Android, or Kindle Fire device use, including the phone’s browser, messaging and social media apps. Check reviews and talk to other parents to find one that feels right for you. Once you’ve covered the rules and limits, let your kid personalize the new phone. Picking out backgrounds and wallpaper, and shopping for a case that will protect the device but also show their personality make a new phone a great adventure. Smartphones may be a big responsibility, and convenient, but they can also be a lot of fun.